Among the first objects that visitors see is a yellowed pennant from the 1963 March on Washington, and the diploma of Carlotta Walls. The television personality has donated $21 million to the museum. Winfrey’s headshot pops out of magazine covers stretching across the wall: Fortune, EBONY, Mediaweek, National Review, Newsweek. “Watching Oprah: The Oprah Winfrey Show and American Culture” chronicles the social events in the United States from Winfrey’s birth in 1954 through her childhood and her rise in media to her time as the nation’s first self-made black woman billionaire. Winfrey toured the exhibit on Wednesday and told “CBS This Morning” that she was honored by the exhibit and the response to it. “I do believe that we had a big impact on the culture, and I continue to feel that from people every day,” she said. ‘Watching Oprah: The Oprah Winfrey Show and American Culture’ exhibition will open Friday, June 8, at The National Museum of African American History and Culture. On her walkthrough, Winfrey watched one of the exhibit’s televisions displays showing the Supremes singing and dancing on The Ed Sullivan Show. “It was the first time I realized you could be a beautiful black woman on television,” she said. 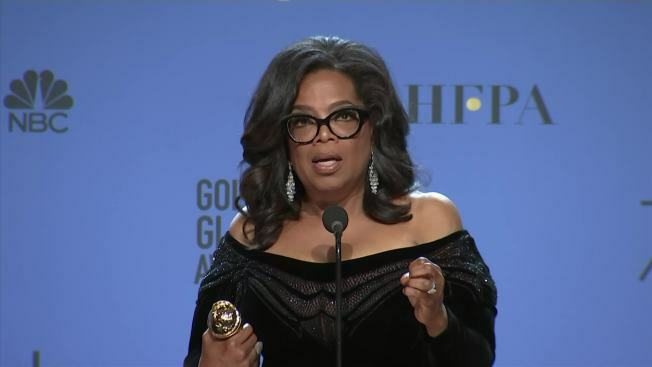 Throughout the gallery, Winfrey’s personal effects — evening gowns, designer clothing and shoes, her drinking glass, the Golden Globe she was awarded earlier this year — are juxtaposed alongside video clips from The Oprah Winfrey Show. There are also blue cue cards, green room photos with celebrity guests, and keys from a vehicle that was a prize in Winfrey’s famous “You get a car!” giveaway. Winfrey’s highly popular daytime talk show aired for 25 years and 4,561 episodes, ending in 2011. Winfrey discussed topics ranging from sexual orientation, body image, health, and, as featured in the museum, the idea of woman empowerment, especially for women of color. “In many ways, we realize that this is a fascinating story, not just about an individual, but about a change in our culture, about the changing notions of the power in media in the role of race,” Bunch said.